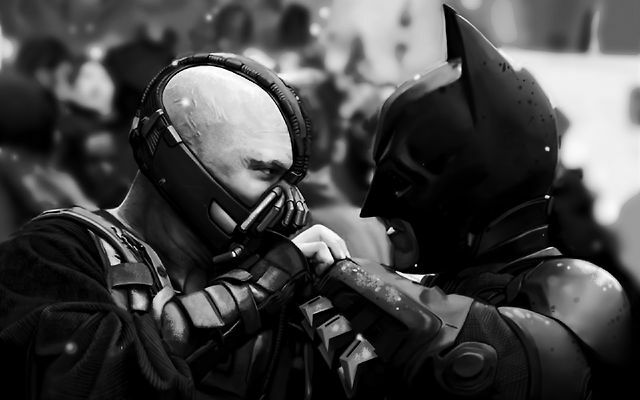 Bane and Batman square off in The Dark Knight Rises. During his recent visit to London, ET recalls a powerful scene with Bane and Batman from The Dark Knight Rises to drive home a message we all need to hear. I’m telling you, that you only got to hit life hard one good time in the mouth. And it will never challenge you, the way it challenged you before. And Bane laughs. And Batman starts to swing and swing and swing! And Batman throws his strongest punch. And Bane grabs it and he says, “Victory has defeated you.” No, listen to what I just said. He told Batman, because Batman – Bruce Wayne, millionaire, extraordinaire – he says, your success, victory, has defeated you. And so Batman all of a sudden takes his little, you know, bat-gun out, right.And he starts cutting all the lights off, right. Because he’s Batman, he thinks he has an advantage in the dark. Take your pain, high school dropout! Take the fact that your father wasn’t in your life! Take the fact that it took you twelve years to get a four year degree! Take the fact that you started with nothing! And you turn that pain into a book! You take your pain and let your pain push you to another level! Push you past what you ever thought you could do! What you ever thought you could be! What you ever thought you could have! You use your pain! You recycle it! Did you attend ETs event in London? What was your key takeaway? Next post: Overcoming Any Obstacle With A Simple Mindset: I CAN. I WILL. I MUST.